Neurofolin is a food for special medical purposes for the dietary support of depression management. It contains 15 mg of L-methylfolate, an active form of folate known to be deficient in individuals with depressive disorders, and helps nutritionally support mood regulation. Neurofolin can be used together with your current antidepressant therapy as advised by your healthcare professional. 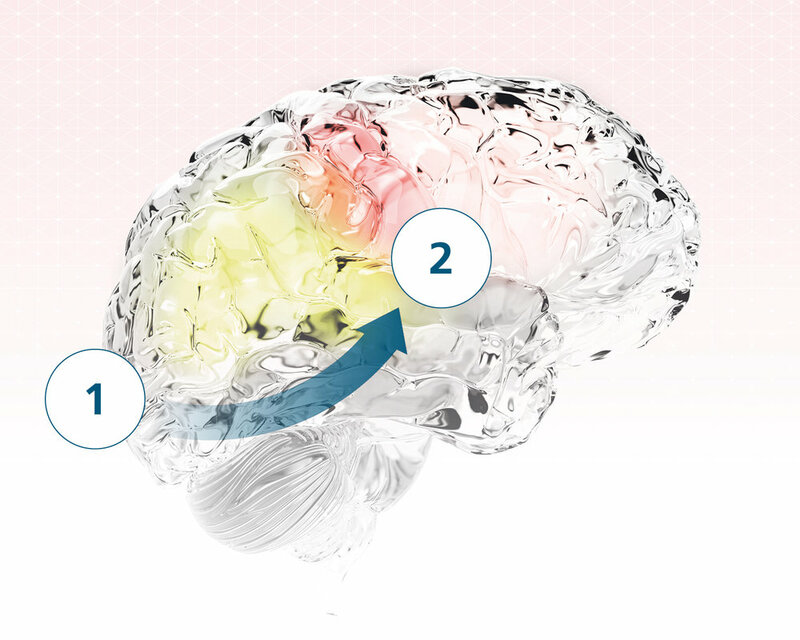 Neurofolin first enters the brain. Once in the brain, its active ingredient L-methylfolate contributes to normal psychological function. How does Neurofolin support you? Neurofolin has been specifically formulated for the dietary support of depression management and contains 15 mg of L-methylfolate. Neurofolin contains L-methylfolate, an active form of folate known to be deficient in individuals with depressive disorders. Please speak to your healthcare professional about whether Neurofolin is right for you. How is Neurofolin different to folic acid in food? Unlike the regular folic acid found in fortified foods, Neurofolin has been specifically formulated for the dietary support of depression management. It contains 15 mg of L-methylfolate to help nutritionally support mood regulation and normal psychological function. How should I take Neurofolin? Take one sachet daily completely dissolved in 200ml of plain or chilled water. Empty sachet, add water, stir vigorously and drink immediately. Not for parenteral use. Use under medical supervision. Please consult your pharmacist, medical practitioner or dietitian for advice. Do not take Neurofolin if you are hypersensitive to any ingredients listed in this product. L-methylfolate may obscure detection of B12 deficiency. Neurofolin should form part of a normal healthy diet. Where can I buy Neurofolin? This website contains information which is targeted to a broad audience and may contain product details or information which may not comply with any legal process, regulation, registration or usage in your country of origin. Neurofolin® is a registered trademark of Grunbiotics Pty Ltd. Metafolin® is a registered trademark of Merck KGaA, Darmstadt, Germany.